Janelle and Richard wed in September on a stunning sunny end of Summer day, up in my favourite part of London, with some of my favourite wedding suppliers. So it makes sense that Janelle and Richards wedding is one if my favourite weddings, ever! Janelle was one of 3 brides who I at one point made up as a bridesmaid. Being asked back to be the make-up artist for the wedding day is always a huge honour, and this trio truly are the most beautiful bunch of friends. In fact, you can see another one of the trio in my blog post here. Janelle’s look was tweaked ever so slightly from her trial to her wedding day, which sometimes happens. Luckily this was a very laid back bride. It’s always a lot easier when I have the full trust of my client. This shot of Janelle (all shots taken by her photographer Dasha Caffrey unless I write otherwise) shows what an incredible face I had to work with. This stage was just shading and creating a soft transition for the darker shades to blend into. Getting ready shots are some of my favourites, biased I know. But it shows the energy of the wedding so well. Janelle was relaxed, funny and surrounded by equally lovely people, and it shows in these photos. Janelle and 2 of her bridal party. A great example of how to take one dress and 2 different colouring’s and make the look work seamlessly for all. 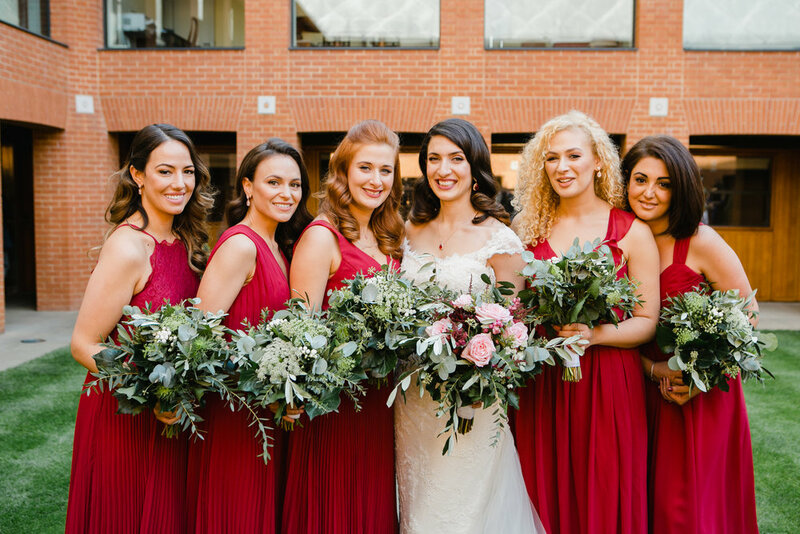 The trick is to keep the look tailored to each individual person and keep the ‘level’ of intensity at or below that of the level of the bride..
On the whole bridal party I used a combination of products. I always start with massively hydrating the skin. This gives the make-up a smoother, plumper base to sit on and makes the make-up last longer too. I used Antonia Burrell Forest Dew Skin Conditioner to smooth and hydrate and customised the moisturiser with one of the Evolve Beauty moisturisers, depending on their skin type and needs. The base was a combination of Charlotte Tilbury Flawless Filter and Deciem The Ordinary Full Coverage Foundation. All colour was Memi make-up using the Matte Muse palette and also the Millenial palette.